How to Install Apps which are Not Available in your Country ? Google Play Store has its own terms & conditions and follows its own set of policies. It could be frustrating if any useful app is not available for your country. 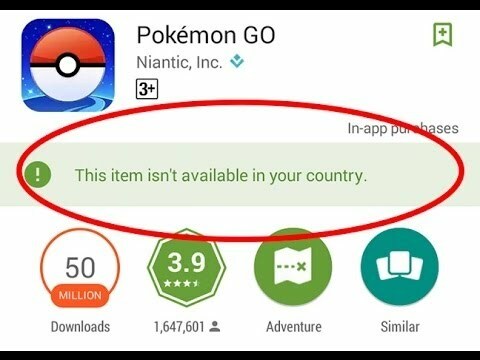 Many apps and items in Play Store may not be available for your country due to various reasons listed below. The best way to bypass this frustrating issue is to set your location in some other country. You can also download an alternative app which offers apps. Follow the methods below to fix the issue of item unavailability in your country. How to Install items/apps Not Available for your Country? Select the country where the app is available and connect through VPN. Yalp Store is Google Play Store Without Google Account. Android is Google’s and you will see Google’s footprint on it everywhere. To use Google Apps on Android, you need an entire bundle of Google Service Apps known as Google Mobile Services or GSM. The GSM includes Google Cloud Services, Google Messaging Services and many ‘irritant’ Google Play Services. Download the alternative app store like Play Store for Android is called Aptoide. Aptoide is similar to Google Play Store offering digital content where you can browse and download the apps. It is like a marketplace app where all the content is available, you need to Google search every time to download the apk file of the app. It presently offers over 300 thousand apps. Aptoide is not available on Play Store because it offends Google’s policy of “No competition clause”. Conclusion: I hope the post was helpful, comment below for any assistance required. This post is for information purpose only DigitBin do not endorse any of the app listed above. If you've any thoughts on Play Store Fix – “This item isn’t available in your country”, then feel free to drop in below comment box. Very resourceful to my cause. Can i wait the days to connect the super vbn? Not working for me with the App – Readfy. The Playstore still says the app is not available in my country, even after using Opera VPN set to Germany and clearing the Play Store app cache and data and forcestoping it. Update: I could not install Readfy using the Playstore on my phone , however, after clearing the Playstore cache and data, again, I used a VPN on my laptop set to Germany, visited the App developers site, clicked on the Playstore link and then much to my surprise, On the Playstore site, it now stated that the app was compatible with my device and I was able to click the Install button. After verifying my Playstore account password, the app remotely installed to my phone. Thankyou soo much Nikhil bhai alternative method worked for me Aptoide is amazing I have finally download My favourite game Thanks Again nikhil ???? It works on all the apps. The App functioning depends on your version. Excellent. Option 2 worked for me in Kuwait. Thanks.